Christine Hyung-Oak Lee is from a Korean family. She was born in New York, and went to school in Queens. She had a stroke at 33 in 2007, which she wrote about in BuzzFeed in 2014. At the start of the book, Lee focuses mainly on the experience of the stroke and the recovery process. But as she goes on, it turns out that she had a lot of problems before the stroke, and these also played a part in the effects of the stroke. As a child of immigrant parents, she found it difficult negotiating between her family values and the culture around her. She had problems with substance abuse and relationships in college, until she got together with Adam, the man she ended up marrying and divorcing. Their marriage had some major problems but she remembers him with occasional warmth. She describes her divorce as more traumatic than her stroke, and blames the stroke for ending her marriage. One wonders what Adam would say about it. Lee's writing style is very much to give a stream of consciousness, and as the book goes on it becomes more disjointed, leaping around from topic to topic and time to time. 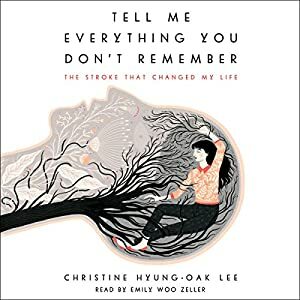 It's an easy read, with the unabridged audiobook energetic performance by Emily Woo Zeller taking only about 7 hours, and the tone is conversational. We quickly get a strong impression that she is suffering a lot and she has a lot to deal with. The actual account of the stroke and the recovery process is impressionistic and more about her anxiety and frustration rather than the particular stages or steps she went through. Gradually, moves from having almost zero short term memory to having mostly normal memory capacity, but it is a long process that takes its toll. She writes eloquently about her experience, making clear how overwhelming it is and the isolation she feels as a result. Ultimately, despite the divorce, she ends on a note of optimism with the birth of her child, although even the birth itself is hard and painful. There are not many memoirs of brain injuries and strokes, so Tell Me Everything You Don't Remember: The Stroke That Changed My Life is a distinctive addition to the genre. It is far from being a guide about how to cope after a stroke, but it is a vivid depiction of Lee's experience.